HubSpot has been around for a dozen years and introduced to the business world the principles and practices of inbound marketing – attracting and engaging potential and existing customers through good and interesting content, SEO, social media, and email marketing. They are also know experts on email marketing that is, after all, also reaching out to people. But the way it’s used by untrained marketers is often largely ineffective. HubSpot has made email marketing one of the cornerstones of its inbound marketing strategies and is one of 12 certification courses offered for free through the HubSpot Academy. In this guide, we’ll discuss what the course offers and evaluate if HubSpot’s email marketing certification is worth your time. What do you get with HubSpot’s email marketing certification? Like all HubSpot certification courses, earning one will build your skills, bolster your credentials, and increase your chances of landing a better job or promotion. Currently, there are over 113,000 marketers worldwide who have taken and passed HubSpot’s various certification courses. You get to learn how to manage email marketing anchored in inbound methods, and transform the ubiquitous email into a powerful marketing tool. Having such skills can be very useful in boosting your career. According to The State of Email Marketing in 2018 study, three of four businesses make considerable time and financial investments on email marketing, sending marketing emails on a weekly or daily basis. Of these sent emails, the most common are promotional emails, invites to company events, newsletters, and product updates. Majority of surveyed companies say that use email marketing to boost customer engagement or expand and sustain their consumer base. What does all these data mean? That there are lots of big opportunities for email marketing professionals as more and more companies realize the importance of email marketing and specialists in this field for their corporate growth strategies, and are ready to spend for it. Having the HubSpot email marketing certification in your resume is your stepping stone for a brighter career. A mastery of email marketing best practices and techniques through HubSpot email marketing certification is bound to propel your business to greater heights. Nothing beats a business owner with teams who both have a profound understanding of how email marketing works and know how to maximize today’s digital tools to implement effective campaigns. It’s an unbeatable combination of adept marketing people and proven technologies harnessing email to their advantage. It’s also a surefire formula to enhance your revenues and grow your business. You will join a community of marketing professionals connected by the inbound ways. There are over 100,000 inbound certified marketers who are transforming how the world does business through HubSpot’s inbound marketing. You can also get invaluable tips and advice rooted in first-hand experiences from the latest marketing campaigns or share your own expertise on how to further optimize HubSpot’s tools and marketing approaches. Your inbound community can become a veritable extension of your own sales and marketing team. 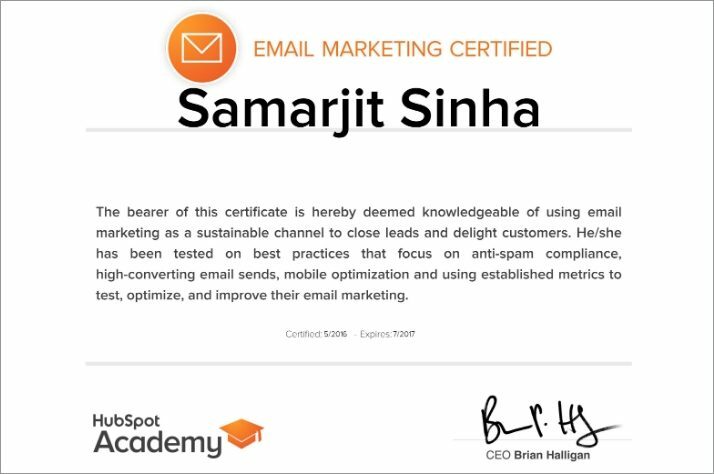 How to get the email marketing certificate from HubSpot Academy? Nine classes divided into easily digestible chunks that encompass nurturing, design, optimization, deliverability, and more. The online classes take only 3.5 hours to finish from which you’ll learn advanced and sustainable email marketing techniques. 60 exam questions where you have to get at least 45 correct answers to pass. You can take the exam three times; if you still failed on the third try, you’ll be locked out for 30 days from taking the exam after which you can simply try again. Email Marketing and Your Business (19 minutes) – This will teach you how all the components good email marketing come together to create a marketing strategy that grows your business as well as your career. Sending the Right Message with Lifecycle Marketing (26 minutes) – Your leads and customers are different and have varying needs, challenges and goals. You’ll learn the critical importance of segmentation for your email marketing success. Contact Management and Segmentation (21 minutes) – This class builds on the concept of segmentation introduced in the Lifecycle Marketing class. You’ll know how segmentation can help you create a better experience for your recipients, and drive better results for your email program. The Components of a High-Performing Email (28 minutes) – You’ll be taught how to create emails that are so effective, inspiring and compelling to your recipients. Email Design and Functionality (22 minutes) – A good email uses design to improve the content. You’ll understand and have a practical framework for using design to improve the messaging and performance of your emails, develop an immediate connection with your readers, and improve your conversions. The Essentials of Email Deliverability (38 minutes) – You’ll learn how to measure and improve your email deliverability using both before-send and after-send best practices including inbox placement rates, segmentation, calls to action, and engagement. Developing Relationships with Lead Nurturing (27 minutes) – This will help you integrate lead nurturing into your business and guide you through creating a great lead nurturing workflow. Measuring Success with Email Analytics (26 minutes) – You’ll know how to build a data-driven email marketing program; understand what works and what doesn’t; and learn how to measure, test, and improve the emails that you send. Email Optimization and Testing (26 minutes) – You’ll learn how to identify opportunities to improve your emails and run a successful test to remove frictions and bottlenecks from your funnel. Here’s how your email marketing certificate will look like. It is best to understand Hubspot’s email marketing from the inbound perspective from which their approach comes from. Inbound marketing, according to marketing strategist David Meerman Scott, allows marketers to “earn their way” into customers’ awareness instead of invading their awareness through paid advertisements. Inbound marketing, through HubSpot’s email marketing software and other marketing solutions, helps you create relevant and compelling content, allowing potential and existing customers to find you via popular channels like social media, blogs, and search engines. Where outbound marketing only lets you scramble for space and attention via traditional advertising, inbound marketing allows you to create content tailored to meet the needs of your ideal customers, entice qualified prospects, and firm up the reputation and recall of your business. Inbound marketing allows your customers to come to you because of your engaging content or interesting information about your product and services which they found online. This approach ties up with today’s changing customer trends – seeking information online and on social media before they purchase a product, using search engines to find what they want to buy, reading blogs and emails for relevant content. Customers will come to you if you give them the content and information they need, and email is one of the best ways to engage with them. This is why most digital marketing campaigns and promotional strategies today use the email platform. HubSpot just optimized and made more effective the communication medium that everyone has been using ever since. You may also want to look into HubSpot’s inbound marketing certification for even more useful learning materials. Simply put, yes. The HubSpot email marketing certification is worth your time and puts you on the crossroads of current digital marketing best practices. Gone are the days where you blindly send out tons of generic emails to just about anyone hoping someone is interested. It haven’t been effective then, and surely won’t work now especially with a new generation of discriminating customers. Nowadays, the buying public looks for value and goes for trends, scouring the Internet for compelling stories about products and services. This is where HubSpots solutions on content management and SEO come in. HubSpot’s email marketing is definitely one of the many great inbound tools you can use to get people to connect with you. Hubspot’s email marketing techniques will empower you to send the right email messages to the right people at the right time, ensuring that you get clicks and opens. Studies have shown that people are much more likely to respond to emails that are well presented, professionally designed, have convenient call-to-action buttons, are personalized and targeted specifically to their needs and tastes, and have relevant and helpful content. The knowledge you will gain from the HubSpot email marketing certification deserves your time if you are serious enough in moving your career and business forward. So, if you want to take a dive into the world of inbound you can start your free email marketing certification here. Is HubSpot’s Inbound Marketing Certification Worth Your Time?